This entry was posted in Uncategorized and tagged Amphawa, Floating Market, Samut Songkhram by christao408. Bookmark the permalink. Nice pictures! 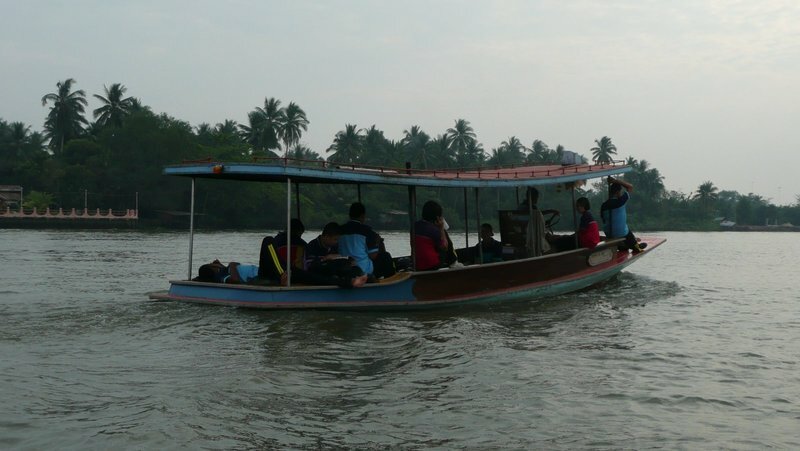 It’s good Ploy’s mom did recognize you … that’s one of the intangible rewards of teaching. I guess Ploy will have more opportunities ahead for her than her mom had which is great. You are a great host, a great blog writer, and a great teacher. Beautiful photos. It’s great that you still maintain some sort of communication with your former students… I think it will go a big way in inspiring them especially considering their rural background. 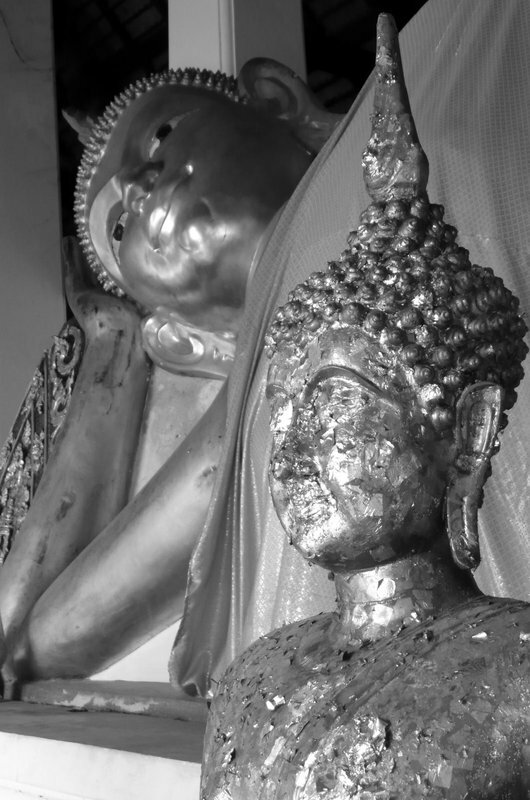 Nice photos, especially that black & white photo with the reclining Buddha. 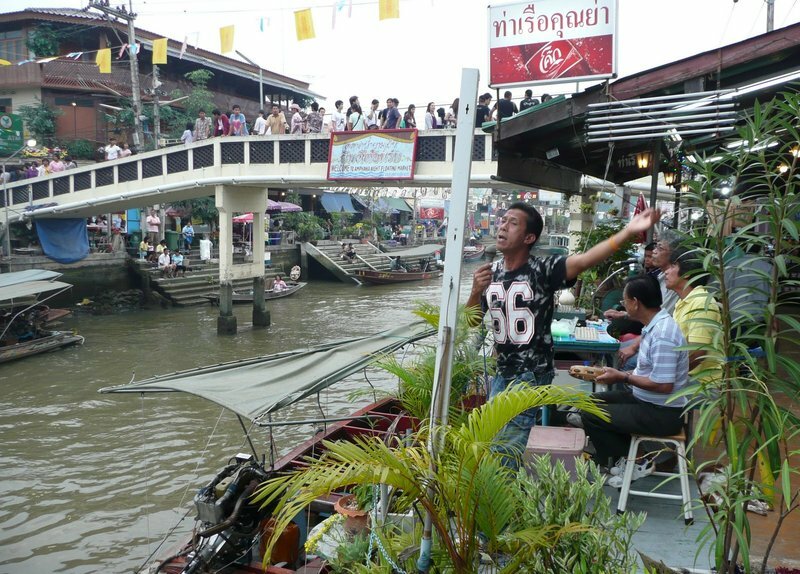 It was a nice day trip out to that ‘not-so-touristy’ floating market. I guess this will be on my itinery too! Great photos. For all the time I spent in Thailand, I never made it to the night market. Tend to avoid places that are a tourist circus, Koa San excepted. That’s why I ended up living in Uttaradit. 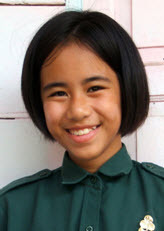 You must have made an important contribution to Ploy’s education to be so quickly remembered! The photos are good – I’m curious about the B&W – is the statue in the foreground textured or is it peeling? 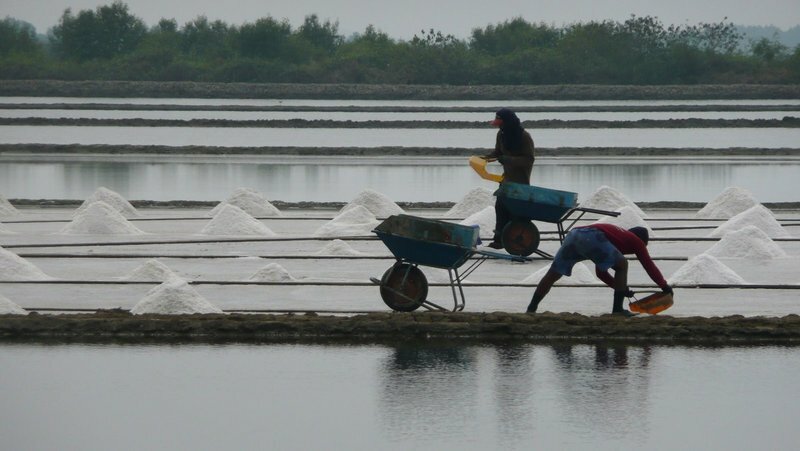 You know, I don’t think I’ve ever thought about how sea salt is harvested so the first couple pictures are very eye-opening for me. There’s so many products out there that we don’t think about how they are actually gotten or made! Chris,Thank you so much for sharing your vivid photos once again. You are always taking me on a new adventure, right from my own office. I LOVE that you also include photos of food, everyday life and the working class, alongside the photos of historic architecture and sculpture. This clash of ancient and current seem to penetrate our eyes every day, every where, but often we don’t truly LOOK and see it. These images of people on the street and in the fields are the true reflection of the contemporary culture and recording it all will make your reflection and memories of those moments pure. Thank you again for giving us a reflection of our time in another part of the world. Oh, cool, you met up with David!So why did you stop volunteering? 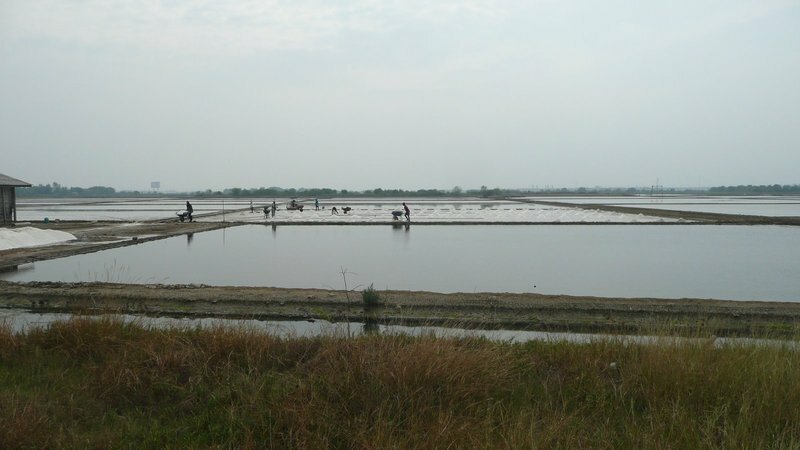 When the British in India restricted all produce from reaching the people, Gandhi directed the Indians to harvest salt from the three waters, the Indian Ocean, Bay of Bengal and the Arabian Sea. I had only heard of the impact it had on the British. I had never seen the harvesting of salt.If I did, I do not remember. So these pictures were reminescent of a time gone by. I am so happy that Ploy’s mother recognized you. It had to make you feel so proud of her accomplishments. That weed whacker looks like it could propel those boats in the canals and rivers (with the very long shaft). It doesn’t surprise me that you’ve had a positive impact on your students at all. I can only imagine their conversation that evening. I hope David updates his Xanga soon. 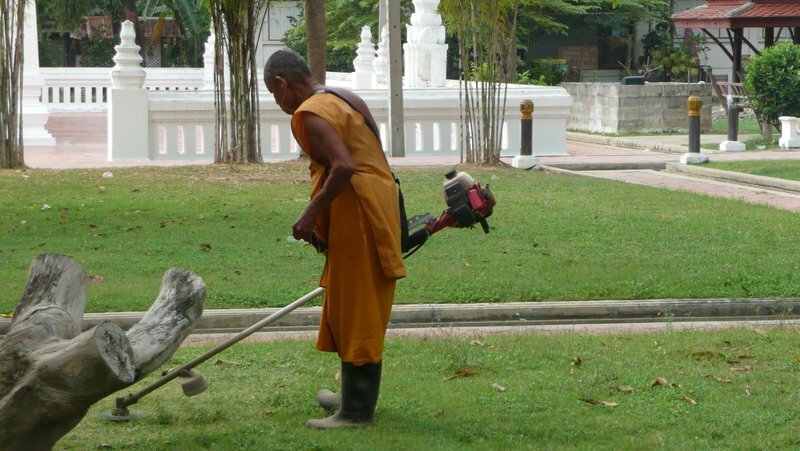 @ElusiveWords – Yeah, the weed whacker is probably one of the propellers from a canal boat. Did you know they use old engines from Toyota pickup trucks to power those boats? True story. @ZSA_MD – It did make me feel good about the teaching and I’m glad I had a positive impact. @Wangium – When the school director retired from her job (going on to other responsibilities) she wrapped up the program. Not knowing who her replacement was and since we weren’t official teachers who had undergone background checks, etc. she wanted to avoid any potentially messy situations. She would stake her personal reputation on us but wasn’t sure anyone else would. @Art4ArtSake – I’m glad you enjoy the entries so much. A window on the world, as it were. @TheCheshireGrins – One of these days I’ll buy some of the salt form the roadside stands and see what it tastes like. I don’t know if it undergoes much more processing (if any) before they bag it. 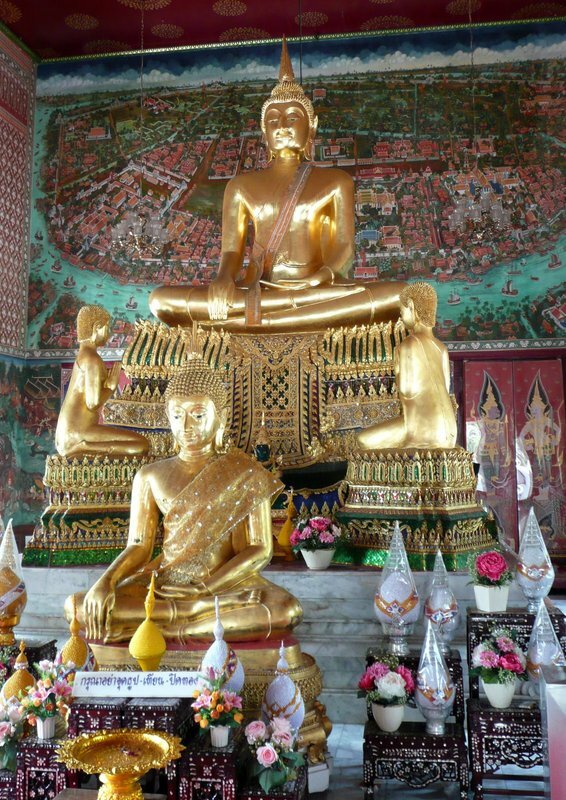 @murisopsis – Buddhists place small squares of gold leaf on statues as an act of prayer. These never adhese very well and flap in the breeze, giving this “peeling” appearance. @Rm2046 – Oh, I didn’t know you were a piano teacher, too. A man of many talents and, I would imagine, quite a bit of patience! @amygwen – This is one reason I like the Amphawa market. Unlike the popular one up the road at Damnoen Saduak, Amphawa’s market isn’t overun with foreign tourists. Plenty of Thai tourists, yes, but what you see there isn’t artifice. It’s more of an adaptation to current realities. @yang1815 – Yes. @CurryPuffy – Add it to the list. You’ll have a lot to do on your next visit! @Dezinerdreams – I hope so. @stevew918 – That’s sweet of you to say. I hope my teaching was good enough although I honestly don’t know as it wasn’t very structured. @TheLatinObserver – She’s a bright girl and I hope she can go on to do great things. Especially with women in Thai society, so many of them never reach their full potential which is a shame not only for them but also for the society as a whole. The amount of corruption here would be greatly reduced if more women were in power. I’m curious — how many Xangans would you say have come to visit you in Thailand over the years? I remember Ploy! She was definitely one of the brightest students that I saw when I visited the school. @arenadi – Hmmm… let me think about that. Maybe ten people in four years? Well, that’s ten people to whom I’m not related. There are some family members who blog who have visitied, too. Of the ten, most of them are no longer blogging frequently, if at all. So when are you coming? @marc11864 – Yes, all of the girls were much brighter than the boys.